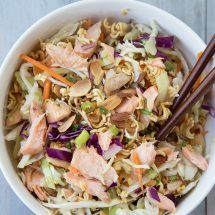 This Crunchy Ramen Noodle Salmon Salad is a unique, updated version of the potluck classic Ramen Noodle Salad. 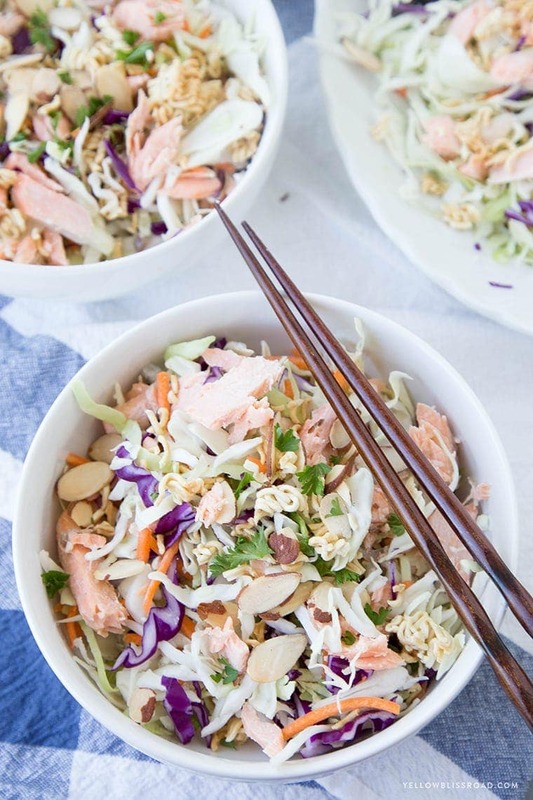 With toasted almonds and Ramen noodles, a sweet Asian style dressing and good-for-you baked salmon, this salad is sure to win over the potluck crowd! We’ve been eating healthier, and this has meant including salmon on our dinner menu at least once a week. I get bored with the same thing over and over; in fact I rarely make the exact same recipe twice! We all know that salmon is packed full of omega-3s and other healthy benefits, but the same baked salmon week after week was weighing on me. I decided I needed to come up with some alternative ways to enjoy this healthy fish. I created some Baked Salmon Teriyaki Lettuce Wraps that were absolutely to die for. 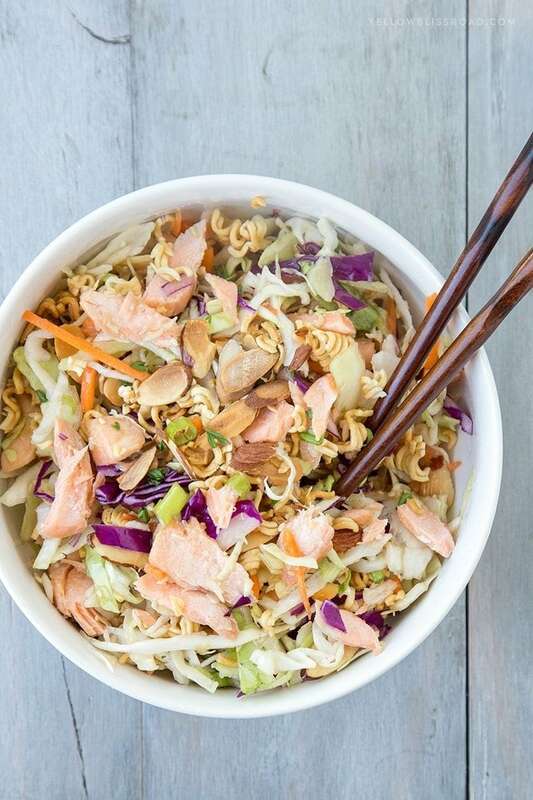 I knew that salmon could be great in a salad, so I came up with this variation on the old stand-by potluck classic Asian style Ramen Noodle Salad. 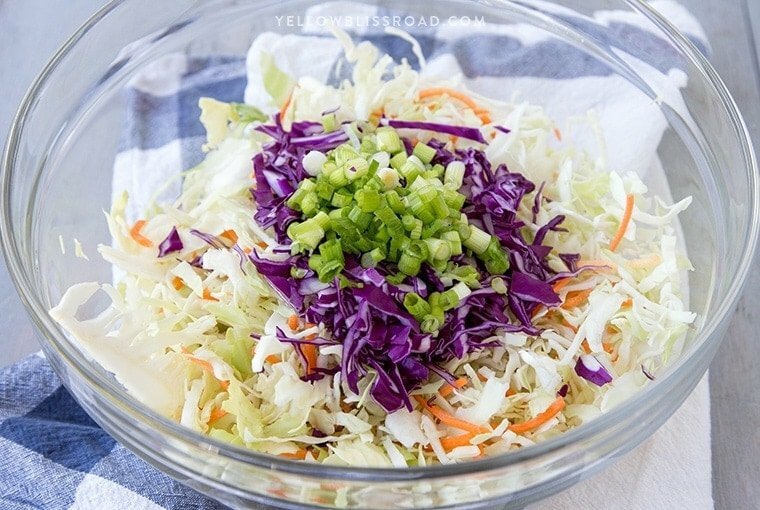 The base for the salad is a coleslaw mix; you could also chop your own cabbage and carrots. I added some red cabbage because that’s my favorite thing to have in salads. There’s also some fresh parsley and chopped green onions. 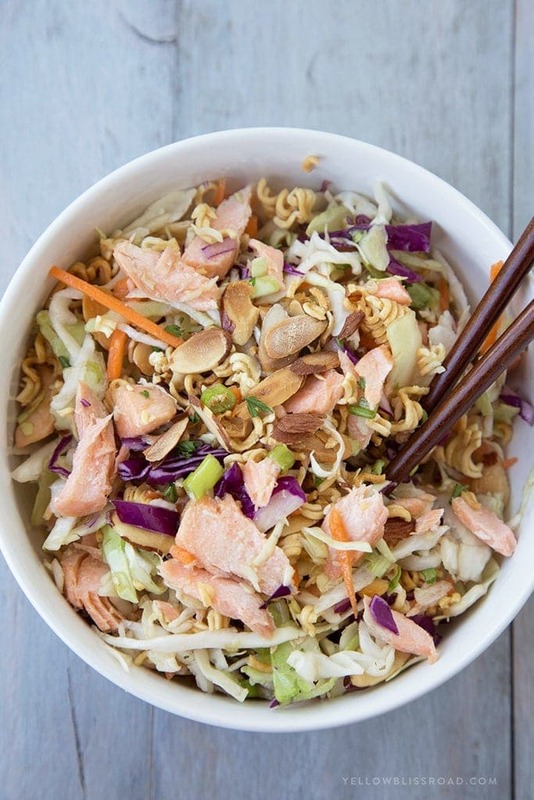 The crunch come not only from the cabbage but from the toasted Ramen noodles and almonds. You could definitely toss them in the salad without toasting, but trust me when I say that toasting them brings out the most amazing flavor, and completely enhances the crunch. 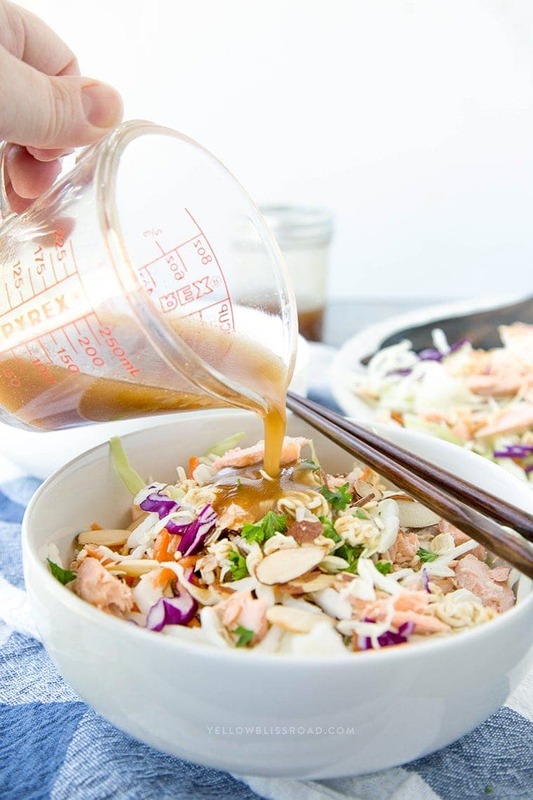 The dressing is basically a sweet teriyaki-style dressing with soy sauce, Worcestershire, sugar, honey and vegetable oil. 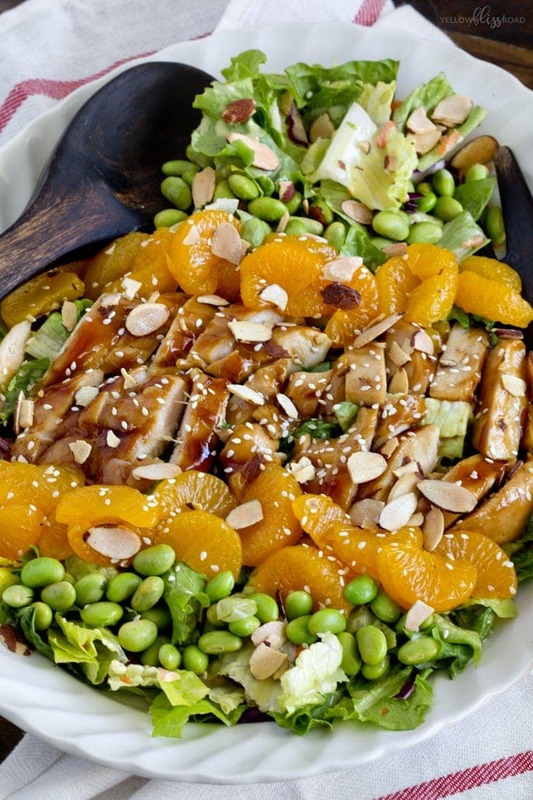 The salad is best when tossed together just as you are ready to serve. Dressing the salad too soon can make the noodles soft, and you really want that yummy crunch. Preheat oven to 400 degrees. Arrange salmon in a large baking dish and season with a pinch of salt. bake for 16-18 minutes, or until cooked through. Transfer to a plate; remove skin and discard. Gently flake salmon apart and set aside. 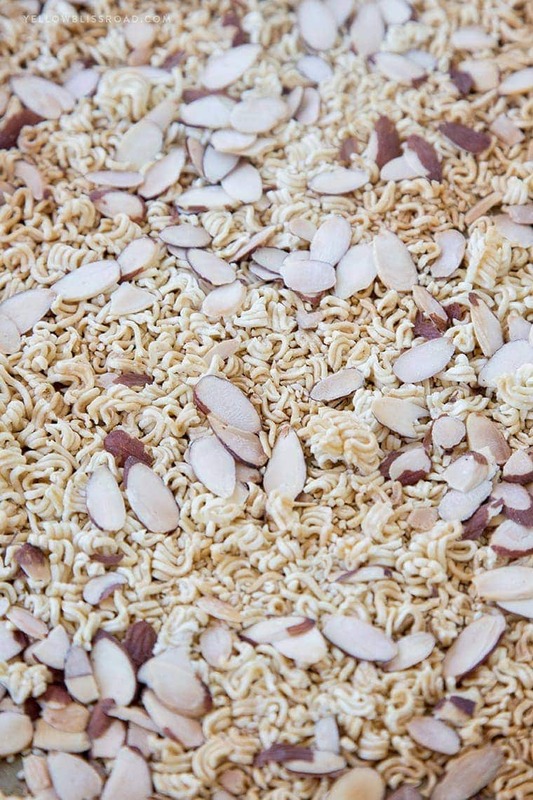 Break uncooked Ramen noodles into small pieces (discard seasoning packets). Spread noodles, sesame seeds and almonds on a rimmed baking sheet and bake in the 400 degree oven for about 5 minutes or until golden. 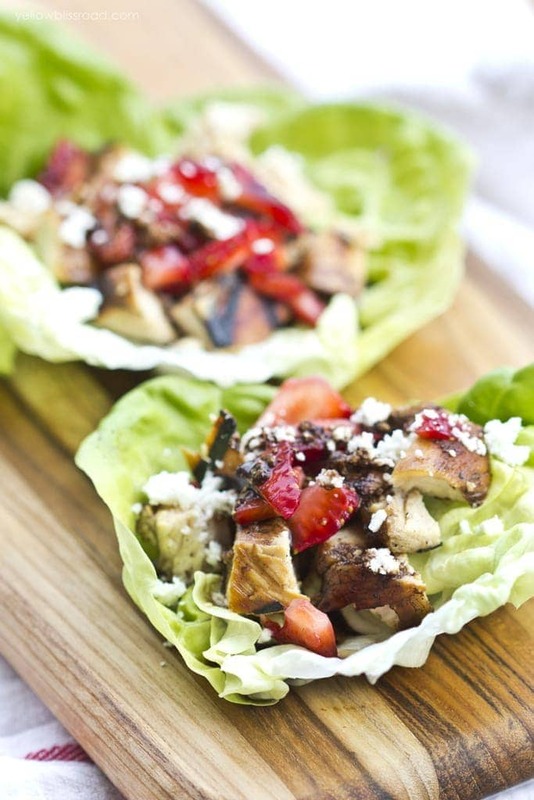 Set aside to cool while you prepare the rest of the salad. In a tightly sealed container, shake together oil, rice vinegar, soy sauce, sugar, honey and Worcestershire sauce, until well combined. Set aside until ready to serve. 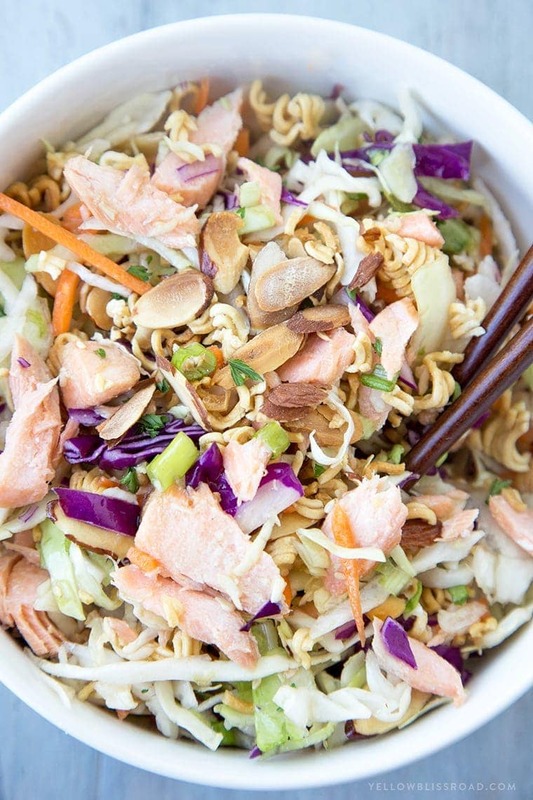 When ready to serve, gently stir in salmon, ramen noodles, almonds and sesame seeds. 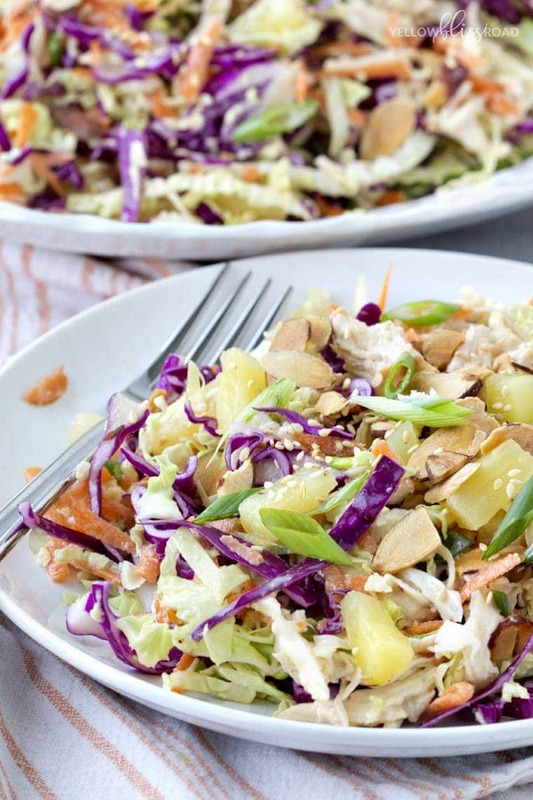 Pour dressing over coleslaw mix and gently toss to coat completely. 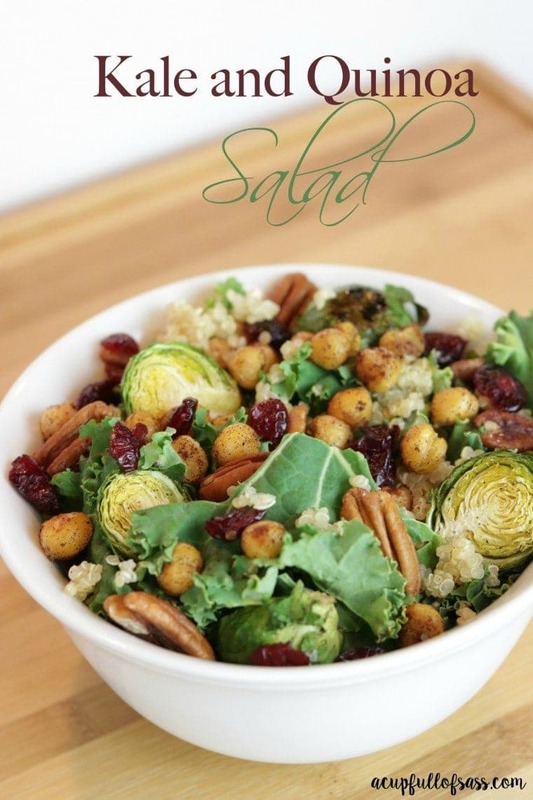 For all salads go HERE and for all recipes go HERE.